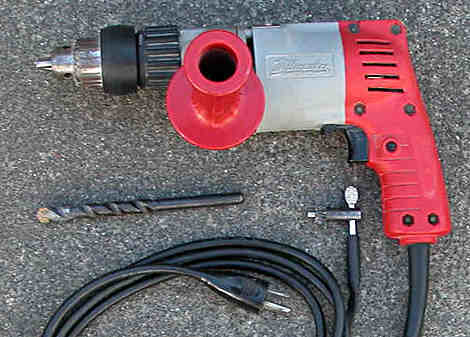 An electric drill that has an on/off hammer option for drilling fairly small holes into masonry. It can also drill steel and wood in the normal way. A drill bit with a Tungsten Carbide insert at the tip that is used in a percussion or hammer drill for drilling into concrete and masonry. A drill bit that steps down in diameter at the shank to enable it to fit into a smaller drill chuck. 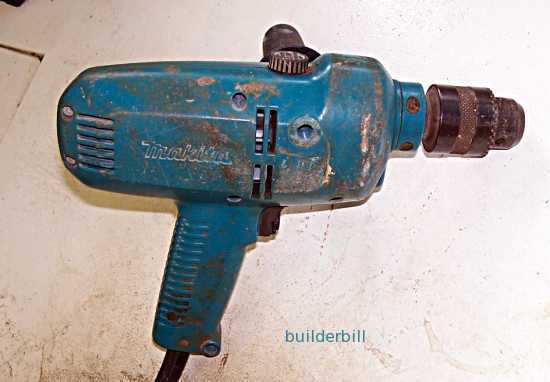 The 12mm Makita drill in the photo is a top end example of these drills. The main distinction of these drills is that they are dual purpose. They can be used with a hammer action for drilling masonry and when the hammer feature is not on then it can be used as a normal drill for timber, steel and plastics etc. Don't confuse these drills with the ones that a generically called hammer drills or rotary hammer drills. They are specific tools for just drilling masonry and they use special bit fittings. Percussion drills are "either or" drills that use a standard three jaw chuck with plain round drill bits. I say that the one above is a top end model, because it has the advantage of four separate drill speeds. Two of them though the gearbox and a high and low electrical switch, giving it a good range of speeds for different work. So for a large bit through steel may use the slowest speed whereas small bits, standard or masonry will use a high speed. This drill has seen a lot of work using standard masonry bits at the highest speed setting. It mainly drills up to 8mm holes for plastic plug an screw fixing or small expanding type bolts and fasteners. When the hole size and depth increases then this is not the best tool to use. The bits start to slip and it is time for a larger, masonry only drill. The photo here shows a generic type of drill and a masonry bit. The bits look just about the same as a standard twist drill but the tip has tungsten inserts. Here is a photo of a masonry bit giving a better view of the tungsten carbide tip. This type of bit is known as a Reduced Shank Bit. The shank being the end that goes into the drill chuck. The reason for this is so that a small drill, say with a 1/4" chuck can still drill a 1/2" hole. It is not recommended to put a small drill to drilling larger holes than it is designed to do on a long term basis, but quite OK for the odd job.